Deadline for registration is Friday, June 6. My garden surrounds one of the original 1920s Hollywoodland cottages in Beachwood Canyon. When I moved here in February 2005, the front garden was all lawn, with a young sycamore tree and a big old camellia. A tall ficus hedge separated the front from the street. 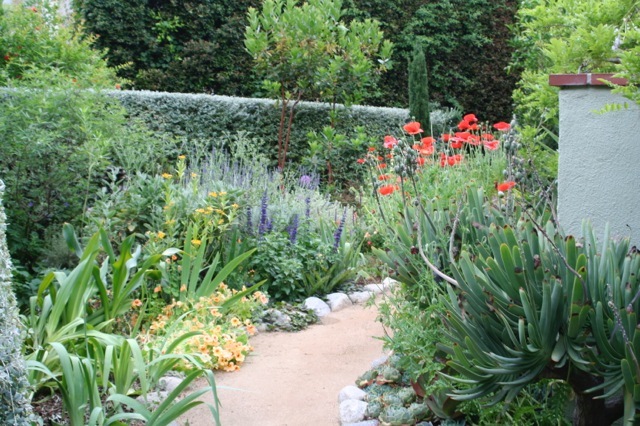 I thought I would live here a short time, perhaps 18 months, so as a garden designer and a lifelong gardener, I knew that I needed quick yet drastic changes. My landlord generously allowed me to do what I wanted. Out went most of the lawn; in went chain link fences to provide security for my dogs. A decrepit wood fence was painted blue to match the roof tile. Tangled vines were tamed by cutting to the ground then re-trained as they grew back. More vines were added to the north, for screening. To give shape to the new garden and to screen out the driveway, I planted and hedged fast-growing Teucrium fruticans. I positioned large pots moved from my former garden to create structure for the paved areas on the side and back of the cottage. My driveway became a nursery, and a place to audition plants for clients’ gardens. The house now feels like a pavilion in a garden, and not coincidentally, like home. When I compiled a plant list last year I discovered that this tiny garden is home to 270 species. In reviewing the list I see that while I have only been here for nine years the plants reflect 25 years of gardening, including plants introduced to me by Phil Chandler (Eupatoria sordidum), Chis Rosmini (Urginea maritima), Gay Hammer, Bill Baker, John Shoustra, David Diaz, Jo O’Connell, Jan Smithen, Judy Wigand, Robin Parer… This spring I am again dealing with a tangle of overgrown vines. I had to cut back drastically so that my neighbor could build a fence. I great opportunity to rearrange, maybe add, plants. Set in a framework of tiled thrones, benches and ceramic art, my garden expands up a hillside in beachwood canyon. 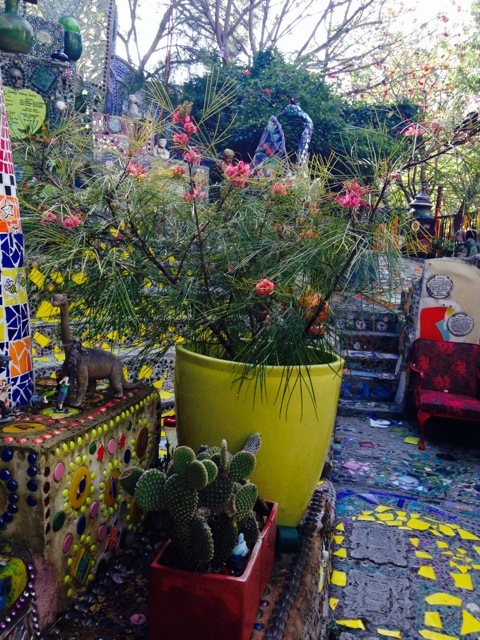 It contains various succulent sections with whimsical sculptures, a hummingbird retreat with grevillevias, salvia’s, honeysuckle and my favorite plant – the secret flower of the incas. David Austin roses surround my heirloom tomatoes, bordered by herbs, a variety of chard, kale, onions, a large bay leaf tree and numerous lemon trees. Started in l991, my garden features many trees and plants purchased from Gary Hammer, whose passion for gardens became contagious…in my case, perhaps even obsessive. But gardening, cooking, music, art and hummingbirds bring so much joy into my life…it’s such a magnificent obsession.